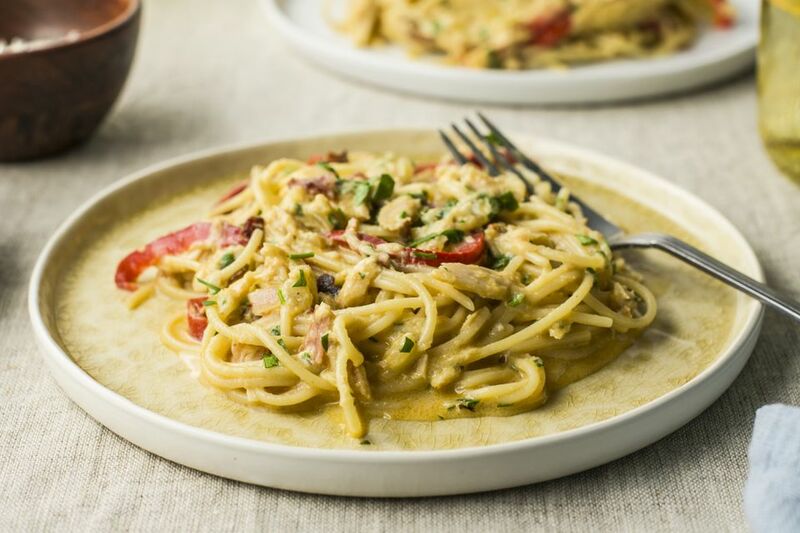 This recipe for tuna carbonara is ready to eat in about 20 minutes, start to finish. It uses ingredients you most likely have on hand in your pantry, fridge, and freezer, so it's a great choice to make when you haven't been to the store for a while or if you're stranded due to weather or illness. You can substitute leftover cooked tuna, or salmon for that matter, for the canned tuna in this recipe or use canned salmon or canned chicken if you'd like. The whole point of a recipe like this is to use what you have in the house. If you don't have bell peppers, use sliced mushrooms or some sliced zucchini, grated carrots, or yellow summer squash. If you don't have spaghetti, linguine or fettuccine will do just fine. Bring a large pot of salted water to a boil. Cook the pasta according to the package directions until just al dente, reserving 1/2 cup of the pasta cooking water. Cook bacon until crisp in a large saucepan over medium heat. Drain on paper towels, crumble, and set aside. Drain off all but 1 tablespoon fat from the pan. Add cream and beat again. In the saucepan you used to cook the bacon, add butter and oil and melt together over medium heat. Sauté the bell pepper, garlic, and onion in the fat until tender. Drain the pasta and add immediately to the pan with the peppers. Add the tuna and cook, stirring, until heated through. Add the egg mixture to pan. Cook and stir, lifting pasta with tongs to allow the sauce to coat the pasta thoroughly. Add the reserved pasta water, cheese, reserved bacon, and parsley, and stir until well-coasted and cheese has melted. How to Make Fresh Homemade Pasta - It's Easy!